If you or your spouse are considering divorce but are not completely sure that’s the best path, you are in a tough spot. And Discernment Counseling is designed for you. It’s a chance to slow down, take a breath, and look at your options for your marriage. Discernment Counseling is a new way of helping couples where one person is “leaning out” of the relationship—and not sure that regular marriage counseling would help–and the other is “leaning in”—that is, interested in rebuilding the marriage. Dr Fiore will help you decide whether to try to restore your marriage to health, move toward divorce, or take a time out and decide later. The goal is for you to gain clarity and confidence about a direction, based on a deeper understanding of your relationship and its possibilities for the future. The goal is not to solve your marital problems but to see if they are solvable. You will each be treated with compassion and respect no matter how you are feeling about your marriage at the moment. No bad guys and good guys. You will come in as a couple but the most important work occurs in the one-to-one conversations with Dr. Fiore. Why? Because you are starting out in different places. 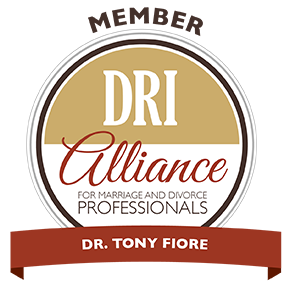 Dr Fiore respects your reasons for divorce while trying to open up the possibility of restoring the marriage to health. He emphasizes the importance of each of you seeing your own contributions to the problems and the possible solutions. This will be useful in future relationships even if this one ends. Number of Sessions: A maximum of five counseling sessions. The first session is usually two hours and the subsequent ones are 1.5 or 2 hours. Discernment Counseling is not suited for situations when one spouse has already made a final decision to divorce, when one spouse is coercing the other to participate of if there is danger of domestic violence.